Boucheron is celebrating its 160 years of creation and innovation. In 2018, Maison Boucheron will be celebrating 160 years of design and creation. Founded in 1858 by Frédéric Boucheron, it is the oldest jewelry Maison in Place Vendôme. Famous throughout the world for its bold, free style, Boucheron has conquered women's hearts by offering ever more creative jewelry set with characterful stones. The Hiver Impérial High Jewelry collection is presented at Laennec, Kering's headquarter, in an immersive scenography around the theme of the Great East. For 160 years, Boucheron has been channeling its expertise into the materials it uses. Recognized as a great sculptor of gold, the Maison has always given priority to working this metal whose magnificence is revealed beneath the artisans' hands. In the Serpent Bohème collection, the animal is not represented figuratively, but symbolically, making the work of the Maison's goldsmiths all the more important. To bring the material to life, the chasers push the metal into shape using hammers and chasing tools. In so doing, the jewelry itself comes to life. The exceptional 26 Vendôme High Jewelry collection is a tribute to the three creative pillars of the Maison : Couture, Architecture and Nature. Frédéric Boucheron soon reveals his ambition and initiative when he decides to expand his business, leaving the arcades of the Palais Royal to start trading in Place Vendôme in 1893. He chooses number 26 Place Vendôme for its strategic location between the new Opéra Garnier district and the Tuileries Gardens. The upper middle class are drawn to these areas with their opportunities for leisure and their fashionable boutiques. The building lies at the corner of Rue de la Paix and the beautiful square designed by Jules Hardouin-Mansart. Boucheron gives his shop a personal touch by having high, majestic openings made. These are adorned with green marble, and he has his name, in capitals, engraved there in fine gold lettering. Since then, Place Vendôme has become the Mecca of French jewelry. The Maison B presents his High Jewelry collection " Rêves d'Ailleurs " at the 26th Biennale des antiquaires. In January 1913, following the request of the Baron and the Baroness E. de R., Boucheron created wedding gifts that their son James intended to offer to his wife on the occasion of their wedding. These wedding gifts included a necklace, a diadem, a headband and a brooch made from 12 white beads and 80 diamonds provided by the Baron. Boucheron provided additional stones in order to complete this outstanding order. The Maison Boucheron welcomes Hiroshi Sugimoto for a temporary exhibition located at 26 Place Vendôme. His work with light echoes the High Jewelry collection " Hôtel de la Lumière ". Frédéric Boucheron's first exhibition at a World's Fair is in 1867, and he wins a gold medal. This award heralds the beginning of a long career, numerous honors and international recognition. At the 1878 World's Fair, the jury is struck once more by the originality of the exhibits; Maison Boucheron wins the Grand Prix for its creations, which include a sapphire necklace created for its wealthy American customer, Marie Louise MacKay. At the center of the necklace is a 159 carat sapphire. The nineteenth century had the most amazing jewelry but it was also the century in which women suffered the most constraints, in fashion as in lifestyle. They were surrounded by maids who helped them dress, style their hair and put on their jewelry. In 1879, Frédéric Boucheron and the head of his workshop, Paul Legrand, invent a revolutionary necklace, without a clasp. This necklace is admired by the members of the jury at the 1889 World's Fair, who award Boucheron the Grand Prix for an outstanding jewelry collection. In 1900, Boucheron wins the gold medal for his jewelry and a Grand Prix for outstanding innovation in jewelry. The Maison Boucheron wins its last Grand Prix in 1931 at the Colonial Fair. Boucheron keeps expanding in Asia. Inspired by the fashion for all things Asian that swept through Europe at the end of the 19th century, the Chinese Salon once again bears witness to the Maison Boucheron's passion for faraway beautiful horizons. The room's elegant dimensions and made-to-measure moldings on its wall panels make the Salon an exceptional work of craftsmanship. The deep red "Martin varnish" used to adorn it give this mythical room at the heart of the boutique at 26, Place Vendôme a secret and intimate ambiance that was much sought-after at the time. Indeed, the Salon featured two window displays, one of which was in reality a hidden doorway giving onto a secret space for clients who wished for the utmost confidentiality. Participation in the Biennale des Antiquaires at the Grand Palais in Paris. Known as “the Divine One”, the Countess of Castiglione was reputed to be the most beautiful woman of the century. A mysterious beauty, she lived in the basement apartments of 26 Place Vendôme thus sharing the Hôtel de Nocé townhouse with Frédéric Boucheron: she particularly loved his creations and soon became one of the Maison’s most important ambassadors. A collector of men’s hearts, namely Napoleon III’s, she was showered with jewelry by those who fell madly in love with her. So as to preserve her beauty from the harsh light of day, she only left her apartments in the evening, adorned in her jewels that sparkled brightly under the lights of the Place Vendôme. Legend has it that, when she returned home and was alone, she would spend hours contemplating them, fascinated by the magical dazzle of the splendid stones. Gérard Boucheron’s cat, Wladimir, was a much-loved feature of the Place Vendôme boutique: he was perfectly at home, weaving through displays of jewels and precious stones. Wladimir’s presence in the private townhouse at 26 Place Vendôme added a genuine feeling of being in a family home. Considered to be a lucky cat and extremely affectionate, he would seek out the client’s gentle patting and stroking. Since then, Boucheron animals have never been aggressive or dangerous. Creation of the High Jewelry timepiece, Ladyhawke Tourbillon, celebrating the collaboration between the Maison Boucheron and Manufacture Girard-Perregaux. In 1785, Rousseau, the watchmaker, invented a new kind of sundial featuring a canon topped by a magnifying glass that was placed in the sun’s path, in perfect alignment with the Parisian meridian. This instrument gave the exact time at 12 noon. The dial, at first located in the gardens of the Palais Royal, sent a daily reflection of sunlight into Frédéric Boucheron’s first boutique, situated under the arches of the gallery. The base of the sundial bore the following inscription "Horas non numero nisi serenas" – “I count only the joyful hours”. Fascinated by this unique approach to time and to life, Frédéric Boucheron decided to adopt the motto as his own. The Maison’s first creations are inspired by this: Frédéric Boucheron wished to be the watchmaker of “Joyful Hours” and through this vision created watches that celebrate life’s special moments. Celebration of the Maison Boucheron’s 150th anniversary at the Petit Palais in Paris. Frédéric Boucheron decides to set up his shop at number 26 Place Vendôme, the place that has the most beautiful light. He also moves his workshops there. Maison Boucheron thus becomes the first major contemporary jewelers to open a boutique into the square. Over time, Place Vendôme becomes the heart of Paris; the showcase of savoir-vivre, savoir-faire and French elegance that has no equal in the world. Delicate and playful, the hedgehog represented by this ring is adorned with one of the Maison's emblematic codes; the Pointe de diamant, and joins the Animaux de Collection, a theme dear to Boucheron. Ever since it was established in 1858, Boucheron has tried and tested different materials. The Maison is interested in fine gemstones and exotic materials and incorporates into its collections lapis lazuli, coral, hematite, onyx, hemp and snakewood. In the 1980s, rock crystal became one of the jewelers' favorite materials. Chosen for its transparency with inclusions, rock crystal quickly became a must in the High Jewelry collections. Carved into jewelry or objets d'art, it offered new stylistic alternatives that continue to inform the Maison's current creative choices, choices that honor the boundless imagination of the Maison's founder. 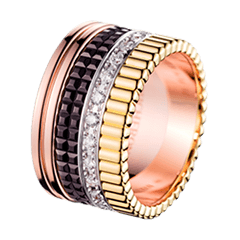 Launch of Quatre: the Maison’s Signature ring. For 160 years, the Maison Boucheron has been carving the history of True Loves, inspired by their extravagances and their quest for the absolute. Because for Boucheron, love is an art. Irrational and universal, it is born in freedom and thrives on passion. This love is vast and cannot be contained. Like a challenge to eternity, it is experienced as an insane zeal for life binding the intensity of love at first sight with the constancy of immortal love. Launch of the Ava collection in homage of the eternal grace of Ava Gardner. The Grand-Duc Wladimir became entranced by a young woman when he picked up a scarf she had dropped during a ball they were both attending. To pay homage to their first encounter and to mark the extraordinary moment forever, he asked Frédéric Boucheron several years later to create a gold necklace that could mimic the suppleness of the finest scarf, as a symbol of his eternal love for his wife. Since then the Maison works on gold as if it were a fabric, a supple and flowing cloth, transforming it into jewels that seem to be woven from gold threads. The Maison Boucheron celebrates its 130th anniversary with a major retrospective at the Jacquemart-André Museum and launches its first fragrance. Nature provides an endless source of inspiration for the Maison: over the years and across the collections, its diversity, aesthetic perfection and rich symbolism have inspired creations as diverse as they are outstanding. 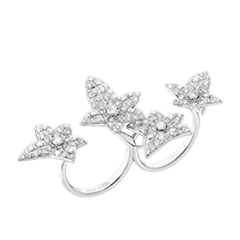 The Maison's own vision of Nature - Triumphant Nature - has always had an impact on its jewelry. No trained flowers or pretty arrangements here. At Boucheron, Nature is free, proud and wild. Each aspect of its reality is captured in order to magnify its beauty. The ivy, pansies or wheat that come out of the workshops of 26 Place Vendôme are a symbolic blend of fantasy and reality. Opening of the first boutique in Japan. This 1910 tiara is a beautiful example of a Japanese inspired piece paying homage to the famous Hokusai painting, entitled The Great Wave of Kanagawa, from the 'Thirty-six views of Mount Fuji' series. The peacock feather motif first appears at Boucheron in 1866. The jeweler is quite overcome by the seductive power of its graphic structure and ethereal grace. Moreover, it is while they are playing with a peacock feather that Frédéric Boucheron and his workshop manager, Paul Legrand, have the idea in 1883 to create the famous Point d'Interrogation necklace. Grand Duke Alexei Alexandrovich Romanov, known for his modern tastes, knows a good thing when he sees it and buys it immediately. Since then, new interpretations of the beautiful feather regularly feature in the High Jewelry collections. Launch of the first pieces of the Serpent collection. This protective animal, symbol of eternity, will become one of the Maison’s key emblems. In 1948, after having written "l’Hymne à l’amour" and to bring herself good luck for the song’s first audition, Edith Piaf bought a Reflet watch from the Maison Boucheron. Following the song’s huge success, she came to regard the Reflet watch as talisman. Between 1949 and 1963, she who was known as La Môme (the kid), acquired no less than 21 Reflet watches, one of which she gave to the love of her life, the boxer Marcel Cerdan. Launch of the first Reflet watch. The appraisal of one of the world’s most fabulous treasures. In 1930, Louis Boucheron was commissioned by the Shah of Iran to assess the Imperial Treasure of Iran: one of the world’s most fabulous treasures, comprising the most amazing precious stones and extraordinary objects Louis Boucheron had ever seen, namely a solid gold throne entirely set with precious gems and a terrestrial globe set with 51 336 stones. It took Louis Boucheron several months to complete the appraisal and the final estimation was kept a secret forever after. Louis Boucheron and his descendants were made the official Curators and Guardians of the Iranian Treasure, which remains in Tehran. Boucheron is asked by the Shah of Iran to assess the Imperial Treasure of Persia and becomes official Curator and Guardian of the treasure. It was in August 1928 that the Maharajah of Patiala arrived at number 26 Place Vendôme, escorted by servants carrying six boxes full of precious stones, including 7 571 diamonds and 1 432 emeralds. 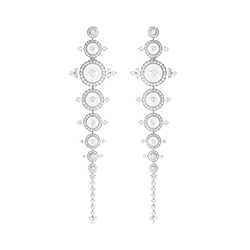 Impressed by Boucheron’s reputation and the special link the Maison had established with India, he ordered an exceptional set of jewelry to be made up of 149 jewelry pieces with the thousands of diamonds, rubies and emeralds from his treasure. To this day, this is the most important and extraordinary order ever seen on Place Vendôme. The Maison Boucheron creates an exceptional diadem that will become one of the Queen Mother Elizabeth’s favorites. In 1883, Grand Duke Alexei, a loyal Boucheron customer, buys an amazing emerald and diamond peacock feather necklace. It is called the 'question mark' because of its innovative shape that wraps around the wearer's neck without needing to be fastened, giving the woman freedom as well as enhancing her beauty. Designed by Frédéric and the head of his workshop, Paul Legrand, this asymmetrical piece is of an unprecedented modernity and will form part of the collection that will win the Gold Medal at the World's Fair in 1889. Louis Boucheron’s first trip to India. These journeys were devoted to the purchase of stones and the sale of jewelry and were to profoundly influence the creation of the Maison Boucheron's High Jewelry creation. Frédéric Boucheron's parents were clothiers, and he remembered the fabrics from his childhood. Having learnt much about delicacy in materials, he began to work into the gold and precious stones the same suppleness he had found in the fabrics and lace of his childhood. The theme of Couture continues to inspire Maison Boucheron, which, through its timeless High Jewelry collections, invents the classics of tomorrow. Opening of a boutique in London’s New Bond Street and an office in New York. Whether in geometric perfection of design or in the purity of Art Deco lines, Boucheron has always displayed a passion for abstraction. For nearly 160 years, Boucheron's inclination for correct proportions, noble structures and majestic forms has influenced its artistic design and creation. At the Universal Exhibition in Paris, The Maison Boucheron receives the gold medal and is established as one of the forerunners of the Art Nouveau movement. The jewelry that comes out of the Boucheron workshops is creative and daring. It is what attracts the women of freer morals to visit his Palais Royal boutique. These women of the demi-monde, as beautiful as they are mysterious, are enchanted by the gemstones and pearls they collect in memory of their lovers and past glories. The Maison Boucheron opens its first boutique in Moscow. It will be transferred to Saint Petersburg in 1911 (the Moscow Boutique was reopened in 2003). From 1860, and for almost forty years, Russia's Imperial Family represent a significant part of Boucheron's clientele. The Grand Duchess Maria Nikolaevna, the Tsarina Maria Alexandrovna, Alexander III and Grand Duke Alexei all stop at Boucheron every time they visit Paris, giving the jeweler's name a good reputation at the Russian court. This is why, in 1897, Frédéric Boucheron decides to open his first shop abroad in Moscow. The Maison Boucheron opens its doors at 26 Place Vendôme and installs its workshop. He shares the premises with the Countess of Castiglione who lives on the mezzanine. 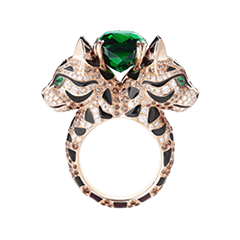 Year after year, to the delight of the initiated, Maison Boucheron adds to its collection of fabulous animals. A pioneer in this area, Boucheron captures the positive force of nature, which is an inexhaustible source of inspiration for the House. More than just jewelry, the jewelry animals are talismans with protective powers. Whether realistic or mythical, they all carry meaning and are named with care. Each of these unusual companions is a unique, exceptional being. 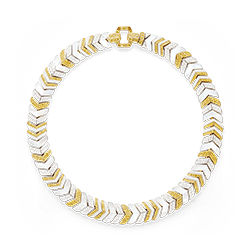 On the occasion of the Universal Exhibition in Paris, Boucheron presents its first “point d’interrogation” necklace. This style of necklace has remained a key element within the Maison Boucheron ever since. One of the most famous jewelry auctions in the world was held in 1887, at the Louvre. The auction of the French Crown Jewels was referred to at that time as “the sale of the century”. Frédéric Boucheron, the only Frenchman amongst the attendance of the world’s most important jewelers, managed to acquire 31 diamonds and among them the celebrated Mazarin diamonds weighing respectively 18 and 16 carats, along with one of Empress Eugénie’s most beautiful jewels, for which the auction stakes skyrocketed. When word was out that Frédéric Boucheron had bought this sumptuous stone, the whole of Paris wondered who had given the acquisition order. It turned out that Frédéric had acquired it for himself so as to set it on a ring for his wife, Gabrielle, as a pledge of his eternal love. 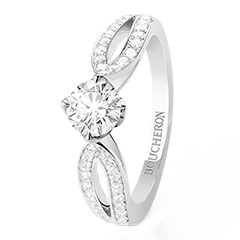 Ever since, Boucheron has been the jeweler of love and tradition has it that the most passionate of men go to the Maison to choose an engagement ring. The diamonds of the French crown are auctioned off. Frédéric Boucheron is the only French buyer. This sale will give rise to the creation of numerous jewels inspired by the crown jewels. Appearing 102 times in the Maison’s special order books between 1876 and 1902, Marie-Louise Mackay, a wealthy American, made the most impressive orders ever known by the Maison Boucheron. She first arrived at Boucheron with no specific creation in mind, simply asking the jeweler for an extraordinary stone. To express his love, her husband asked Frédéric Boucheron to secretly seek out the most exceptional sapphire to match the intense color of her deep blue eyes. He finally selected a 159 carat blue sapphire from Kashmir that he had set onto a necklace, which delighted Mrs Mackay, who was then said to own the world’s most beautiful sapphire. Frédéric Boucheron had already understood that the beauty of a precious stone or jewel is above all a means to highlight and enhance a woman’s radiance. At the Universal Exhibition in Paris, the Maison Boucheron is awarded First Prize for its creations, including a sapphire necklace, created for Marie-Louise MacKay. 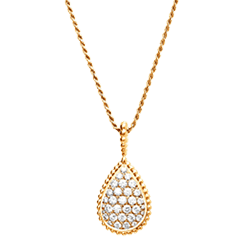 The necklace is adorned with a 159 carat central sapphire. The first designs of the snake jewelry creations in the House’s archives. 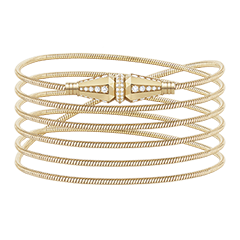 The snake pattern has remained a fundamental of the Maison Boucheron to the present day. Frédéric Boucheron is born in 1831 into a family of clothiers. He breaks with family tradition at a young age to open his jewelry shop. Having learnt much about delicacy in materials, he begins to make his gold work as supple as the fabrics and lace of his childhood. Success is immediate and soon the whole of Paris is rushing to the door of his Palais Royal boutique. In 1893, he is the first jeweler to open a boutique Place Vendôme, making this place a showcase of savoir-vivre, savoir-faire and French elegance that has no equal in the world. It is Frédéric Boucheron's unique ability to capture the zeitgeist that also leads him to invent new ways of wearing jewelry. His success spreads abroad and the order books start to include the names of members of Royal families and later of Hollywood's biggest stars. Frédéric Boucheron is awarded the gold medal for the innovative spirit of his jewelry at the Universal Exhibition in Paris. There is an air of mystery in Serpent Bohème. A captivating design that attracts women of character and fires their femininity. Since first emerging from theMaison's workshop in 1968, the Serpent Bohème Collection has endured over the years to become a Boucheron classic. 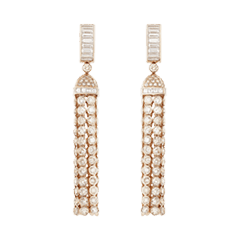 The collection embodies the free spirit and the creativity of Maison Boucheron. Fifty years after it was launched, Serpent Bohème is being reinvented with colored stones to complement the diamond-paved creations. The Maison Boucheron creates its workshop. In 1858, Frédéric Boucheron, who came from a family of clothiers, opened his first Galerie de Valois boutique in Paris, under the arcades of the Palais Royal, the center of Parisian luxury at the time. It marked the beginning of an extraordinary adventure that has lasted for nearly 160 years. Frédéric Boucheron opens his first boutique in the Galerie de Valois under the arcades of the Palais Royal which at that time was the center of the Parisian luxury trade.